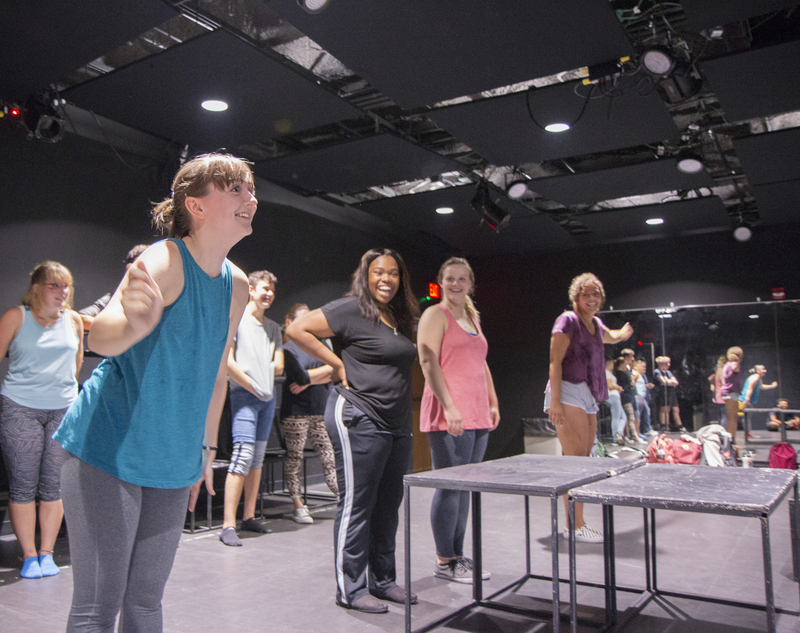 Iowa State University students rehearse for their fall production of "This Is Not a Pipe Dream," opening September 28 in Fisher Theater. ISU Theatre presents a whimsical celebration of surrealist art and the imagination with “This Is Not a Pipe Dream,” opening on Friday, September 28 at 7:30 p.m. The playful, family-friendly production will run for two weekends in Fisher Theater in Ames with special pricing for children’s tickets. Inspired by the life and work of the surrealist painter René Magritte, “This Is Not a Pipe Dream” by Barry Kornhauser follows a young boy who wants to be an artist. Though his desire is dismissed as “a pipe dream,” he begins a quest into the delightfully absurd magic-realism of Magritte’s famous paintings. Directed by Amanda Petefish-Schrag, assistant professor of theatre at Iowa State University, “This Is Not a Pipe Dream” is a celebration of how art and the imagination help people confront life’s traumas and mysteries. “This Is Not a Pipe Dream” opens on Friday, September 28 at 7:30 p.m. with additional evening performances to be held on September 29, October 5 and October 6. Matinee performances will be held at 2:00 p.m. on September 30 and October 7. All performances are in Fisher Theater in Ames. Tickets are available through the Iowa State Center Ticket Office, all Ticketmaster locations or the Fisher Theater box office prior to performances. Tickets are $18 for adults, $16 for seniors, $11 for students and $5 for youth ages 17 and under. For more information, visit www.theatre.iastate.edu, email isutheatre@iastate.edu, or call 515-294-2624. ISU Theatre is funded by ISU Student Government and supported by the Transforming Liberal Arts and Sciences Endowment.